As the US administration places restrictions on the H-1B visas program, highly skilled overseas workers of the US are thinking of moving to Canada. A new platform for immigrants, which helps overseas workers, in the tech industry, to move away from the US, towards Canada, has attracted people, who are eager to head towards Canada in recent months. It connects top skilled workers, with employers in Canada, who aim to fill up the vacant positions. Many of such persons are top and skilled foreign professionals, who work in areas, where a shortage of competent American workers exists. Many people are worried about the restrictive qualities of the job. Compared to the period of stress and uncertainty seen in the US, people are surprised to find that Canada is a fine place. There was a recent announcement by the US administration, regarding a new policy, which makes the application process, difficult for companies, and it will be tough for the skilled workers, to benefit from the H-1B program. U.S. Citizenship and Immigration Services has stated that the applicants, will have to provide detailed statements of their work/work orders, regarding the work done by employees in the US, working on an H-1B visa, at the site of a third-party. Employers must provide additional information, regarding the reason, to hire an outsider, in the US, to do a specific job. It is feared that President Trump will halt any H-1B visa extensions. By increasing formalities in the H-1B program, approvals for applications will be reduced. Data reveals that the Trump administration has challenged visa applications at a higher level when compared to the Obama administration. These measures hold back the process of issuing visas. At this juncture, Canada is ever more determined to expand the entry of immigrants. In June 2017, Canada launched the Global Talent Stream program, which is a fast-track extension of the Temporary Foreign Worker Program and permits highly skilled workers, belonging to the tech industry, to enter Canada for working temporarily, merely in two weeks. 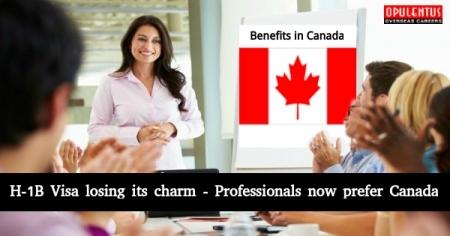 Canada is facilitating the companies to hire professionals with least bureaucracy. It is of immense benefit to companies, which want international talents. Canada is known for its diversity, which is its unique strength. Opening up for immigration, will help the companies, to grow in a fast manner, bring more skills, and introduce the country to new innovations. Immigrants possessing skilled work experience can apply to seek permanent residency in Canada, by using the points-based Express Entry program of the country. It avoids wasting a part of productive life based on a restrictive visa when the going gets harder. Many people are put off, from visiting the US today. Indirectly the policies of President Trump are helping Canada.